Can you please tell me how much this book is worth? The one I have is in excellant condition. I am not a professional book dealer, so I’m afraid I can’t do that for you. Mine was free thanks to volunteering at a used book shop, so I can’t really offer any more advice than doing some research on it at ABE Books, Alibris, or some other retailer. PS – I removed your phone number from your comment to prevent it being spammed. 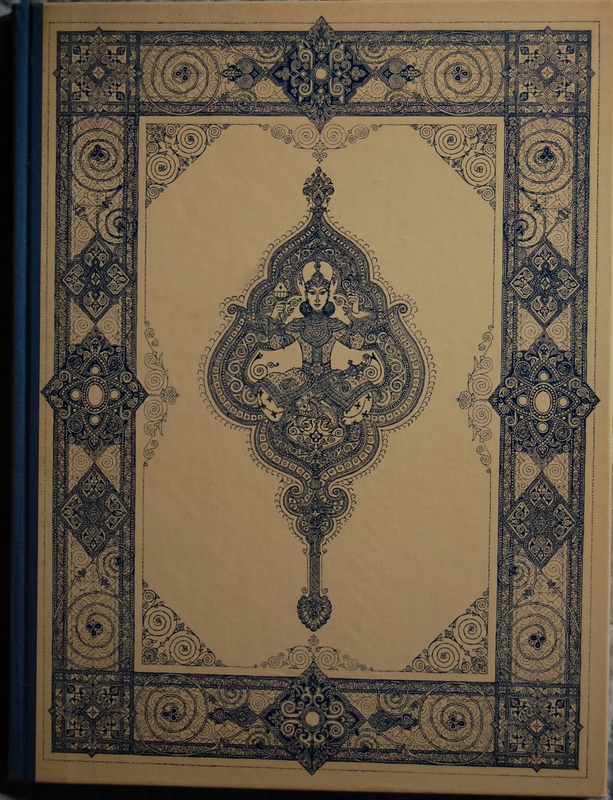 I have that same exact copy in excellent condition as well as a smaller pocket (very old) leather bound edition. The smaller version was printed in Great Britain and the artwork is by Willy Pogany. There isn’t a date of publishing anywhere to be found. The leather is dry and peeling at the edges. Any insight on this copy would be helpful. As I told Elizabeth, I’m not a professional book dealer, so your best bet to find out info on the books you have is to do some online research yourself! Otherwise, you could always visit your local used/antiquarian book shop and see what they think. It is a lovely book, though – I hope you treasure it! I heard that the 1940 has french folding on pages – (every page double sized but folded over). Is that the same with this 1946 edition ? You know, I do not know off the top of my head. I’ll check when I get back home. I don’t think they are. I am the same person as Bookshrimp on the Library-Thing forum, btw (I wasn’t able to use the same Username as here as it was already taken). 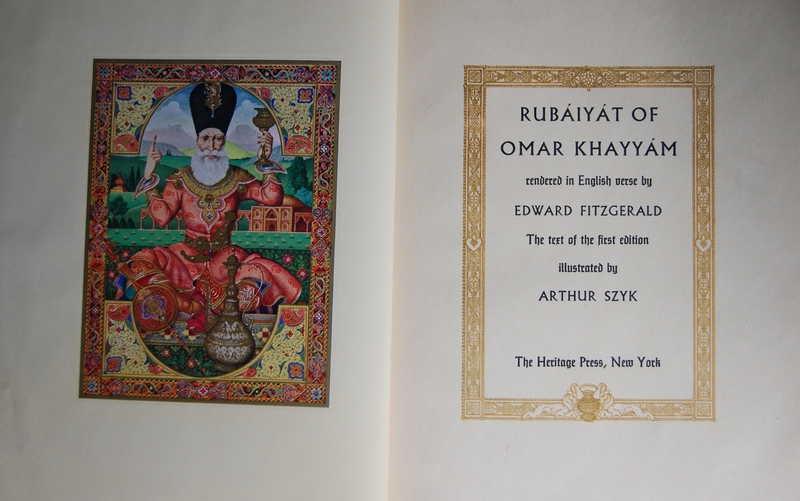 I just got my 1940 HP edition of Rubaiyat !!! # the Front board’s cover art is Gold – (gilt-like) on an off white yellow-ish background. Have to hold it at correct angle and light to see the gold-ish paint glittering. # Spine has the inscription in dark blue. 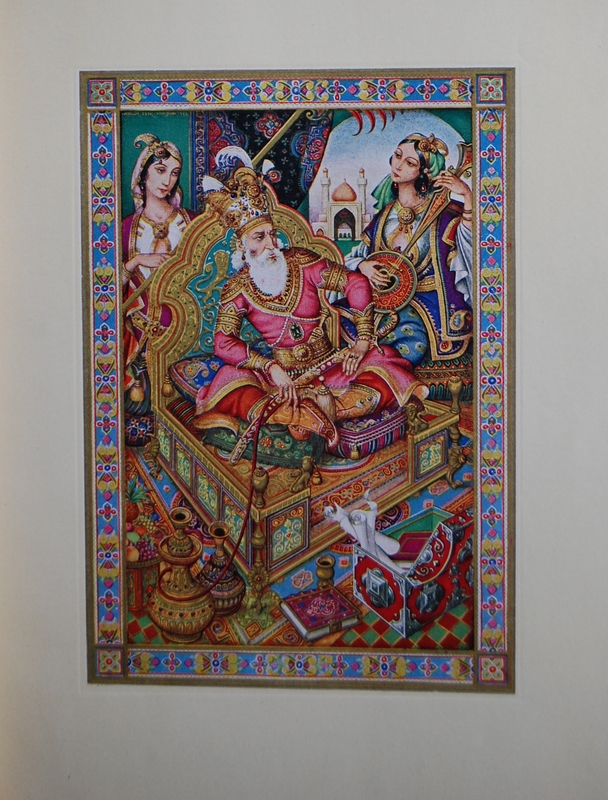 # Biggest things is – like you stated – zyk’s paintings are mounted directly to the pages – and you can see and feel the indentation made on each page for the drawings – as if the drawing lays on its own little bed. Pages are french fold – double size pages then folded back into the hinge/binding. If you would like photos, I can take some and send them to you, if you’d like to post them here or on the Macy forum. I’ve got the ’46 edition, in its boxed sleeve, with the Sandglass. It is Number: 1:36R. I believe I may be the first person to open the cover. It is flawless. I found it at a public library book sale. Would you believe $1.50? I’ve walked away with some amazing bargains from library sales, too. That is a treasure at a steal of a price! 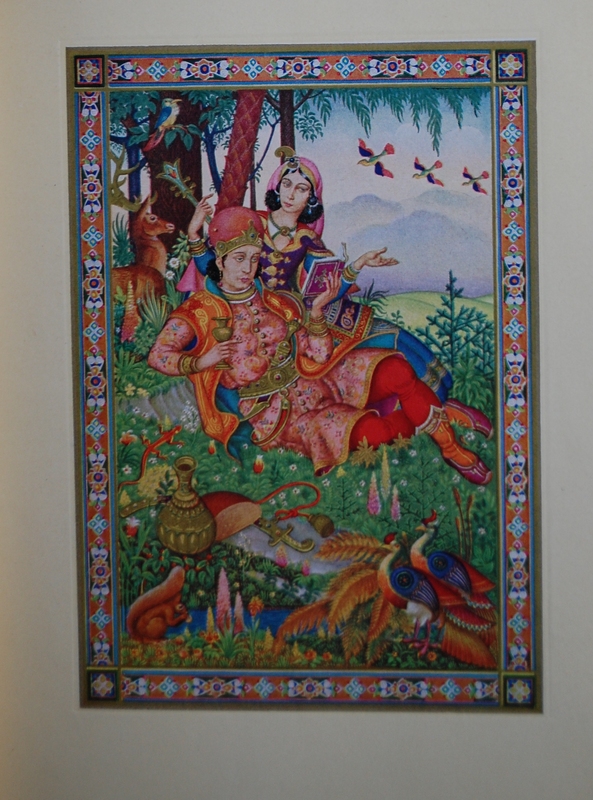 You are currently reading Heritage Press: The Rubaiyat of Omar Khayyam (1946) at The George Macy Imagery.